Anyone who has an idea for a smartphone application but doesn’t have the skills to be able to create it themselves may be interested in a new solution which has been created by Ken Davis based in Chicago called the ThinΛpp. ThinΛpp takes the form of a prebuilt fully customisable hybrid mobile application, and has launched by the Kickstarter crowdfunding website this week to raise $10,000 to help take the project forward. Watch the video below to learn more about the ThinΛpp and how it can be used to help create your very own personalised smartphone application. 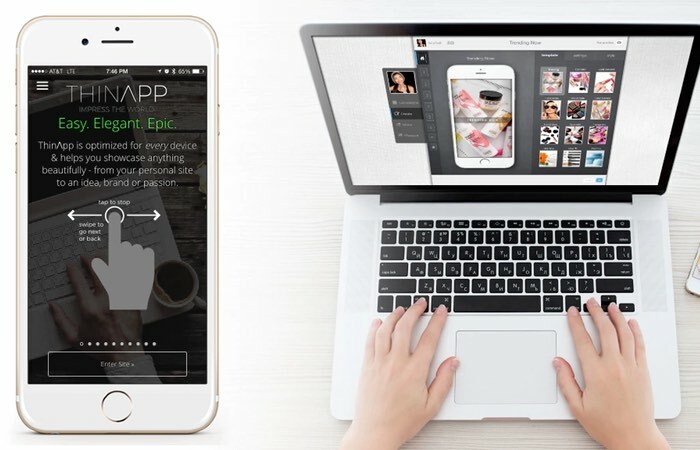 ThinΛpp is a pre-built Hybrid App platform that makes it easy and affordable to create a custom mobile App – for any business, passion, interest, website or idea. We wanted to take the best of the latest Web App technology and the best of Native Apps to create a unique, new Hybrid product that was an affordable alternative to those without the huge budgets to create (and maintain) their own custom apps. ThinΛpp is: 85% Web App + 15% Native App. ThinΛpp is coded/built with the most popular web based languages and latest internet standards. This makes it more flexible, more affordable, faster to develop and more accessible than traditional “native” based Apps while still having the same look, feel and functionality of a Native App. And, yes, Apps made with ThinΛpp can also be downloaded from the App Store and Google Play. For more information on the new ThinΛpp jump over to the Kickstarter website for details following the link below.